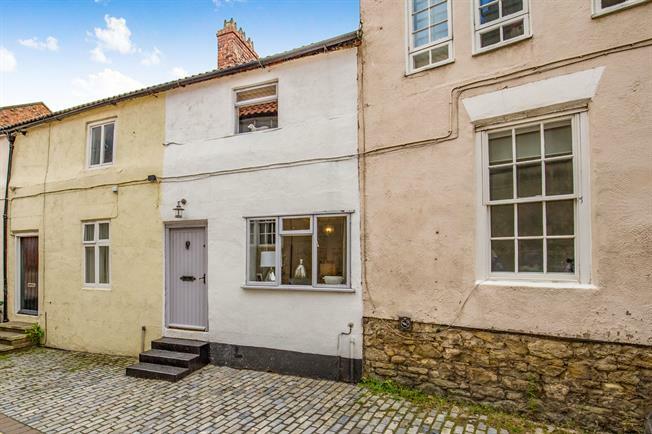 2 Bedroom Terraced Cottage For Sale in Yarm for Offers Over £145,000. Glazed window to the front aspect, beams to ceiling, oak mantel with log burning stove, tiled flooring, radiator, large storage cupboard and stairs to the first floor. Fitted with a range of shaker wall and base units with contrasting work surfaces over incorporating a ceramic Belfast sink. Space for a range cooker with extractor hood over, integrated washer/dryer, space for fridge/freezer and wall mounted combination boiler. Part tiled walls, tiled flooring, feature radiator, spot lights to ceiling, glazed window and wooden door to the rear aspect. Storage cupboard, smoke alarm and access to the loft space. Two glazed windows to the rear aspect and radiator. Glazed window to the front aspect, wardrobe and radiator. Fitted with a white contemporary four piece suite briefly comprising roll top bath, corner shower cubicle, wash hand basin, low level WC. Part tiled walls, tiled flooring, heated towel rail, extractor fan, spot lights to ceiling and glazed window to the rear aspect.